The "Great Flood of 1894" was the highest-recorded flood along the Columbia of all time. Rainfall was heavy during the winter of 1893-94 resulting in a heavy snowpack. 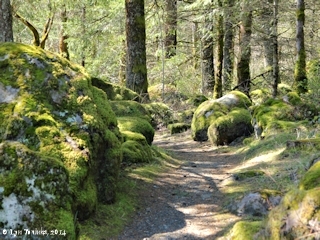 A dry and warm spring resulted in massive snowmelt. "The highest flood (1894) reached a stage of 34.5 feet at Umatilla [U.S. Army Corps of Engineers, 1953]. Flood stage: -- 32 ft, present datum, at site at Umatilla, by U.S. Weather Bureau. Historical data: -- Flood of June 5, 1894, reached a stage of 44.2 ft at present site (from levels by Corps of Engineers), or 41.8 ft., present datum, at site at Umatilla (by U.S. Weather Bureau). Peak stages and discharges: June 5, 1894, Gage height was 34.5 feet. "Sheriff E. M. Leslie, of Sherman county, states that the entire population of Grant had been forced to remove from the town, and that a number of buildings had been washed away. Smith's store, Hale & Slade's livery stable and a number of dwelling houses have gone. The distillery remains, but is said to be badly damaged. The machine shop of Mackenzie & Sons was strongly braced, but the force of the current was so great as to almost wreck the building, though the braces held it in position. Almost all the railroad track between Grant and Arlington is reported to be destroyed, and nearly all the poles of the Western Union telegraph line are down and the whole line wrecked. The fisheries have been suffering constantly. In addition to begin forced to desist from fishing, the greater part of the wheels here have been washed away. There are now but two or three stationary wheels left." "From the foot of Ten-Mile Rapids to the head of Five-Mile Rapids, a distance of about three miles, the river has built up gravel bars on both sides through which the channel is wide and deep which gives the river a rather beautiful look, but this look suddenly changes, for at the head of Five-Mile Rapids a third rock reef crosses the river and its general height is not less than 70 feet above low water. The rock reef is really two miles in length up and down stream and the river selected the weakest point in this natural dam and today the channel it has worn is about 165 feet in width and propularly believed to be bottomless but the maximum depth at any point is probably not over 100 feet at extreme low water. These rapids while generally known as Five-Mile Rapids are The Dalles of the Columbia River of which mention is made in the early business of the Columbia River. As all the flow of the river must pass through this narrow passage, the river rises as high as 94 feet at the head of the rapds during the extreme flood stages like that of 1894. The river after passing through the Dalles Rapids enters what is known as the "Big Eddy," Here the river has worn a large hole in the reef about 1500 feet in diameter. Evidently the river at this point spent its energy which was aquired in falling over the reef before it had cut the deep gorge through from the head of the reef." Source: "Sunday Oregonian", May 2, 1915, courtesy Historic Oregon Newspapers Archives, University of Oregon Libraries, 2018. The flood of 1894 crested in the Columbia on June 6 and 7, when the flow at The Dalles, Oregon, 191 miles inland from the ocean, peaked at 1,240,000 cubic feet per second on June 6. The annual average flow at The Dalles, where river data has been collected since 1879, is 191,400 cubic feet per second. [Source: NWCouncil.org, 2018]. COLUMBIA RIVER MAIN STEM, Columbia River near The Dalles, Oreg. Lat 45°39'00", long. 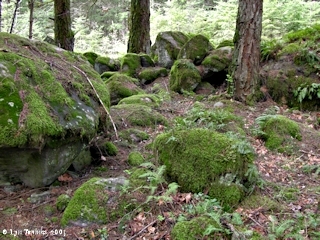 120°58'00", in N. sec. 20, T. 2 N., R. 15 E., 300 ft upstream from entrance to Celilo Canal, 3 miles downstream from Deschutes River, and 11 miles east of The Dalles. 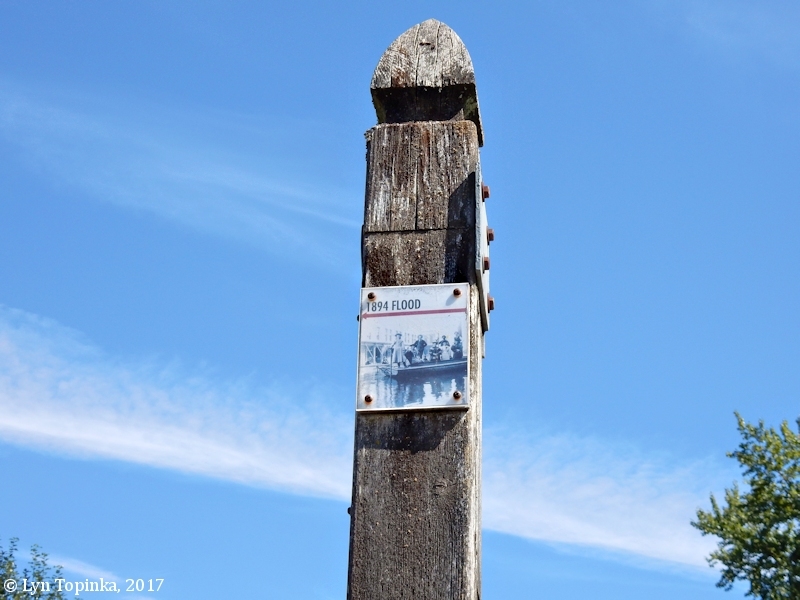 Gage-height records collected at Cascade Locks from 1879 to 1928, at The Dalles since 1892, and at Celilo since 1903, are contained in reports of the U.S. Weather Bureau. Records of chemical analysis and suspended-sediment loads for period January 1910 to January 1911 and August 1911 to August 1912 are published in Water-Supply Papers 339 and 363. Water-stage recorder. 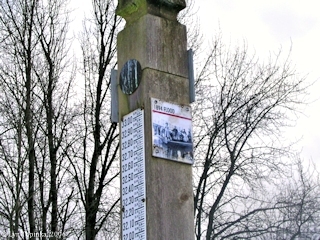 Datum of gage is 0.12 ft above mean sea level, datum of 1929, supplementary adjustment of 1947. 1858 to 1877, maximum stage for each year from levels to high-water marks at Lower Cascades Landing about 54 miles downstream and at different datum. June 1 to Dec. 6, 1878, staff gage at Umatilla 88 miles upstream at different datum. Dec. 12, 1878, to Oct. 9, 1879, and July I, 1881, to Jan. 31 1892, staff gage just upstream from Cascade Locks 52 miles downstream from present site and at datum 52.56 ft lower than present datum. Oct. 10, 1879, to June 30, 1881, staff gage 2,000 ft downstream from ferry landing at The Dalles and at datum 40.86 ft higher than present datum. Feb. 1, 1892, to Sept. 30, 1931, staff gage 300 ft upstream from ferry landing at The Dalles at datum 46.86 ft higher than present datum. 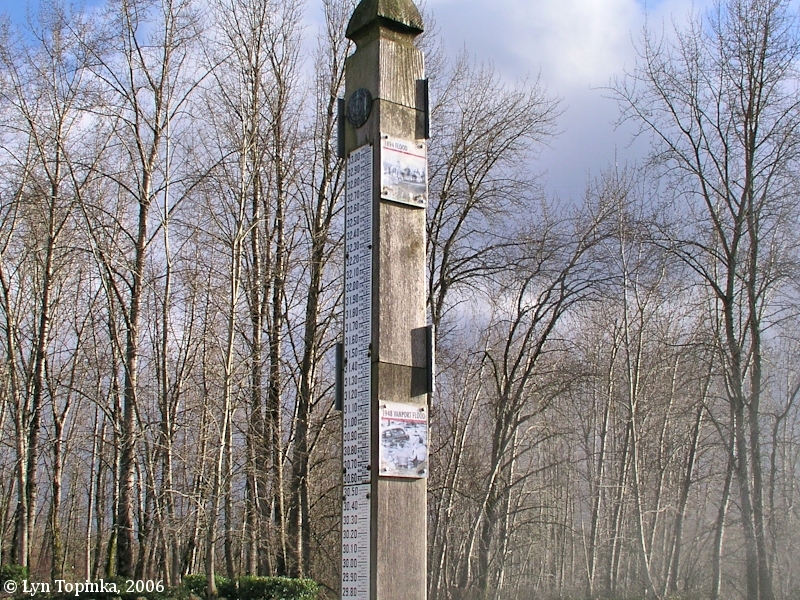 Periods of no gage-height record at The Dalles were supplemented by gage-height record obtained at gage just upstream from Cascade Locks. Oct. 1, 1931, to May I, 1935, staff gage in entrance to Celilo Canal 300 ft downstream from present site and at datum 37.59 ft higher. Present site (report through 1950): 300 ft upstream from entrance to Celilo Canal, 3 miles downstream from Deschutes River, and 11 miles east of The Dalles. 72 years (1878-1950), 194,400 cubic feet per second (cfs) (revised). 1858-1950: Maximum discharge, 1,240,000 cfs June 6, 1894 (gage height, 106.5 ft on gage at The Dalles, 160.1 ft present site); minimum observed, 35,000 cfs Jan. 12, 1937 (gage height, 126.0 ft). Storage and diversion for irrigation. of about 4,000,000 acres above station are only a small part of the total flow. Some regulation by Franklin D. Roosevelt Lake since about 1940, and by many other reservoirs above station. Source: Wells, J.V.B., 1958, Compilation of records of surface waters of the United States through September 1950 : Part 14. Pacific Slope basins in Oregon and lower Columbia River Basin, USGS Water Supply Paper 1318. "At The Dalles the river is now falling slowly, to the great relief of every one, and hopes are entertained that the inundated district, which comprises the major portion of the town, will soon be free of water and fit for occupancy again. But after the water is gone, it will require considerabe time to put the flooded district in shape for use, and to prepare the buildings and to get things in order once more. The strong currents that since the rise have been rushing through First and Second streets have carried a vast amount of debris into the side streets, alleys and vacant places, that will take time and a great amount of labor and expense to remove. A number of bildings have been washed from their foundations, and the foundations of many others loosened and impaired. It is impossible as yet to compute the amount of damage caused the town by the flood, but that it will be very great is certain. With but two or three exceptions every stock of goods in the town was removed -- and some of them twice to get them out of reach of the waters -- and a large number of people were compelled to move from their residences to that part of town, out of reach of the river, where every vacant building is now inhabited. Many unable to secure houses are living in tents and cheap board cabins, hastily erected to serve the purposes of immediate shelter. Nearly all of the merchants are erecting temporary buildings in which to carry on their business until such time as the water will permit them to return to their permanent locations. Several have obtained the church basements, which are all above the water and are quite snugly fixed. In the basement of the Baptist church is an hardware establishment, while in other parts of the same basement are a job printing shop, the editorial office of the Reformer and a grocery store. ... 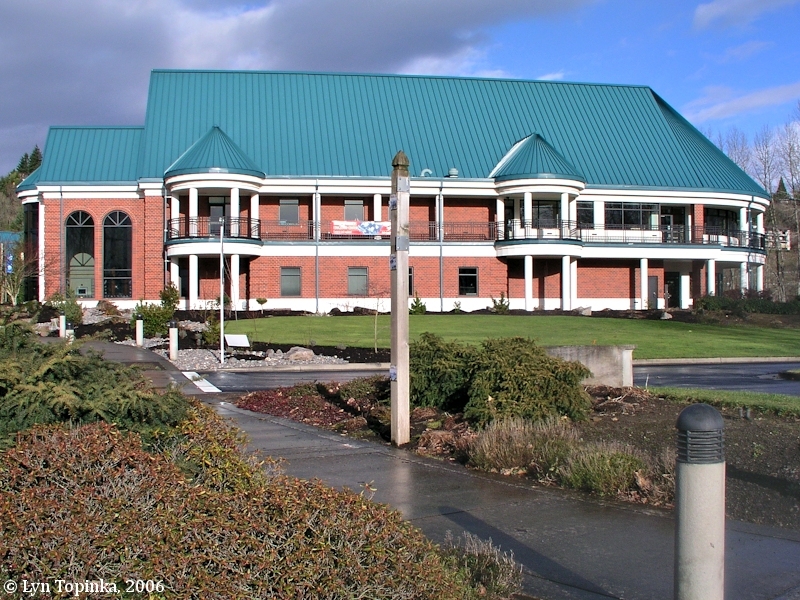 The Dalles National bank has erected a tent in which to do business. The court house was flooded, and the records had to be raised, and the only means of reaching it now is by boat." 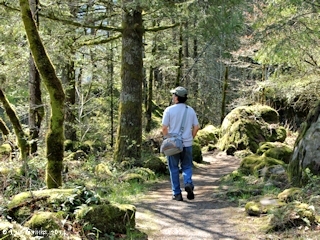 "The trip from this city to Portland now is made with the same difficulty that it was a quarter of a century ago. Since the line of the Union Pacific has washed away the only means of transportation are the D, P, A. N. Co's boats, and the portage at the Cascades is made partly on foot, then by vehicle and the last two-and a half miles on a narrow-guage railroad. Passengers leave here at six o'clock in the morning, and frequently do not arrive in Portland until late at night or early the next morning." Source: "The Dalles Times-Mountaineer", June 23, 1894, courtesy Historic Oregon Newspapers Archives, Unviversity of Oregon Libraries, 2019. 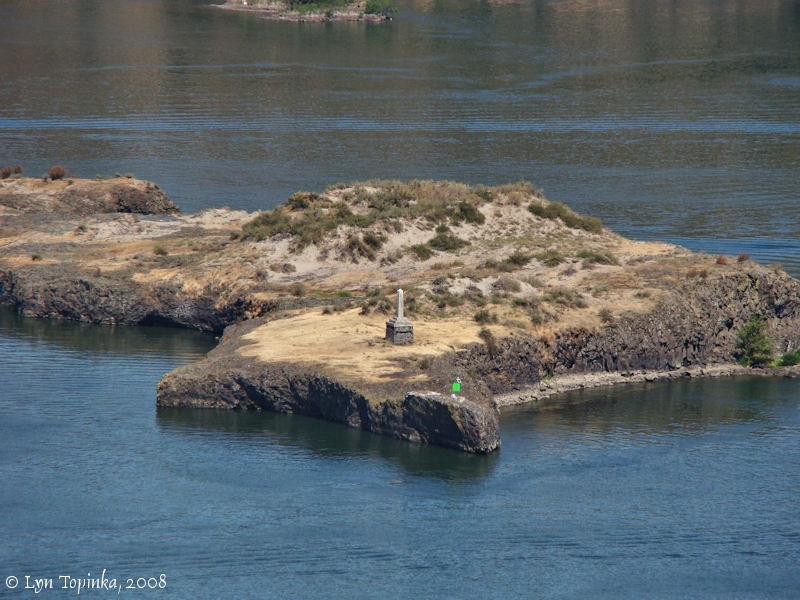 "A few miles above Hood river and just before sighting the deep canyons that guard the approach to The Dalles, is the famous Memalouse Island, where thousands of Indians are buried, their bones and skulls bleaching on top of the rocks. 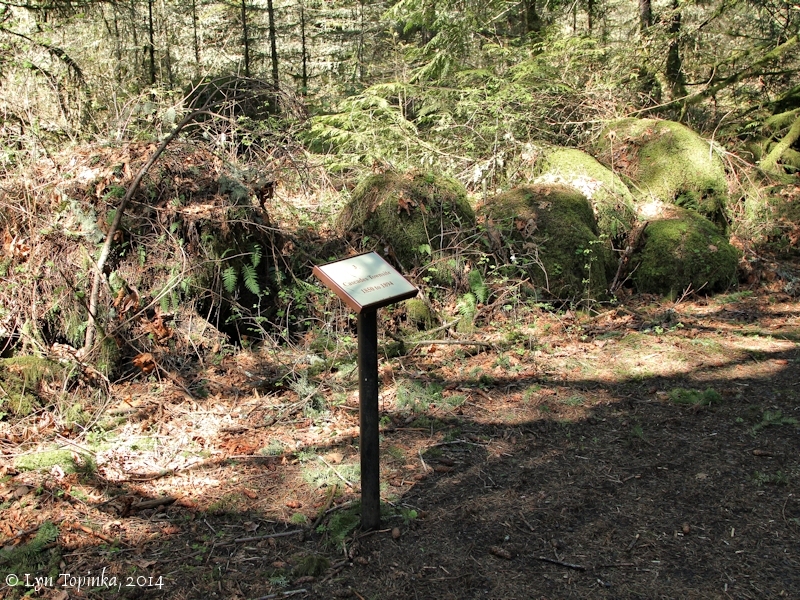 In the center of the island, which is a high bluff promontory devoid of vegetation, is the large monument erected in memory of Vick Trevitt, the greatest friend the Indians ever had in Oregon. ... [They] laid him to rest on this island, erecting a handsome $1500 monument. The shaft, twenty-one feet high, is built of granite, and stands on a 15-foot block hewn out of the solid rock. And the water came to within a few feet of the top of this shaft. This is held to be conclusive proof that for three hundred years at least -- the length of time the Indians have used the place for a burial ground -- there has never been such a flood as that of 1894, for the tribes hold as one of their strictest duties that they shall bury their dead "above high water mark." 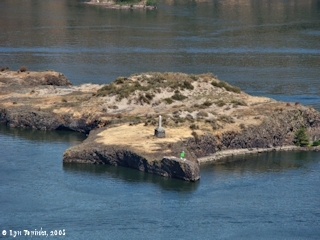 Click image to enlarge Memaloose Island from Memaloose State Park Overlook, Historic Columbia River Highway, Oregon. Image taken August 23, 2008. The highest stage of the 1894 flood was at Cascade Locks. Water there reached 49.7 feet at 4 p.m., June 6, corresponding to a discharge of 1,160,000 second-feet, or 4.89 second-feet per square mile. "The highest flood of which there is authentic record, that of June, 1894, was caused by the coincidence of floods in upper Columbia River and in Snake River, accompanied by heavy rainfall in the lower drainage area. The snowfall all over the Columbia River drainage basin had been exceptionally heavy during the previous winter. 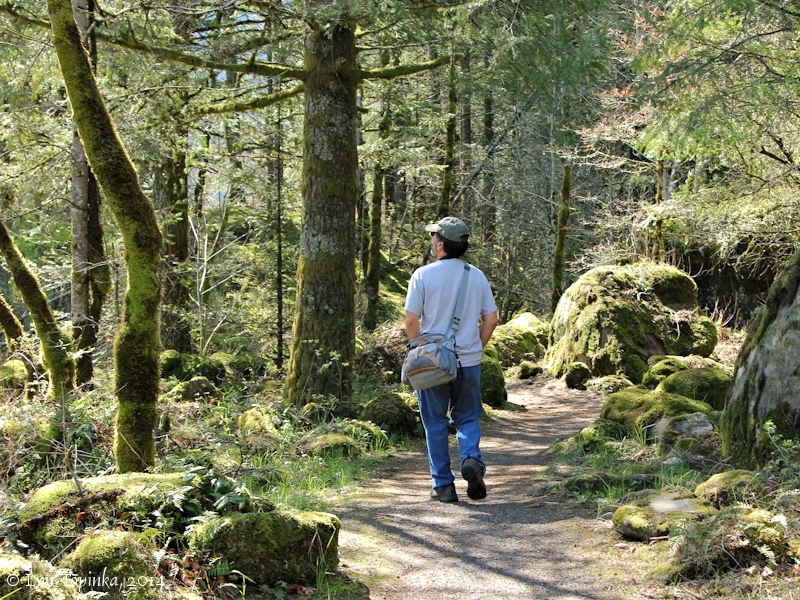 The highest stage at Cascade Locks was 49.7 feet at 4 p.m., June 6, corresponding to a discharge of 1,160,000 second-feet, or 4.89 second-feet per square mile." Source: Henshaw, F.F., and Dean, H.J., 1915, U.S. Geological Survey Water-supply Paper 370, Surface Water Supply of Oregon, 1878-1910. 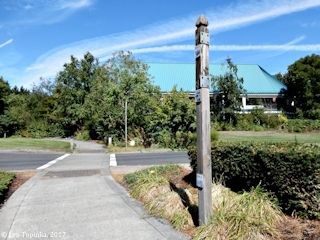 The early town of Cascades, which had been located on Hamilton Island, was totally destroyed in the Flood of 1894. 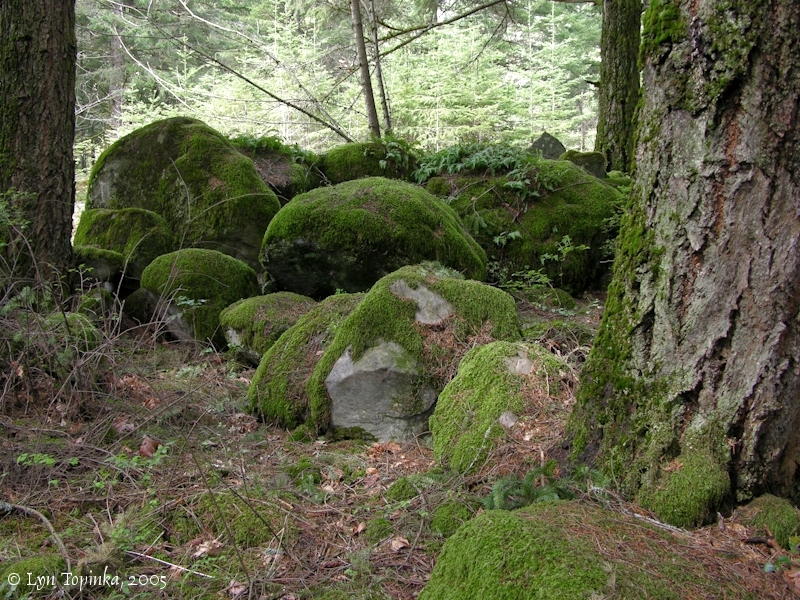 Soil was stripped exposing boulders. The town was never rebuilt. 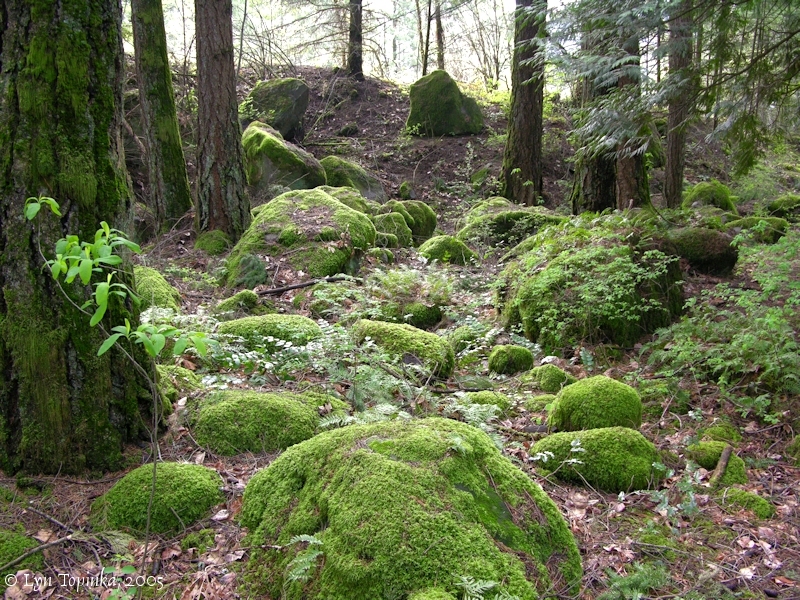 The 1894 flood destroyed the Washington community of Cascades with the force of the flood waters removing several feet of soil and exposing many boulders. 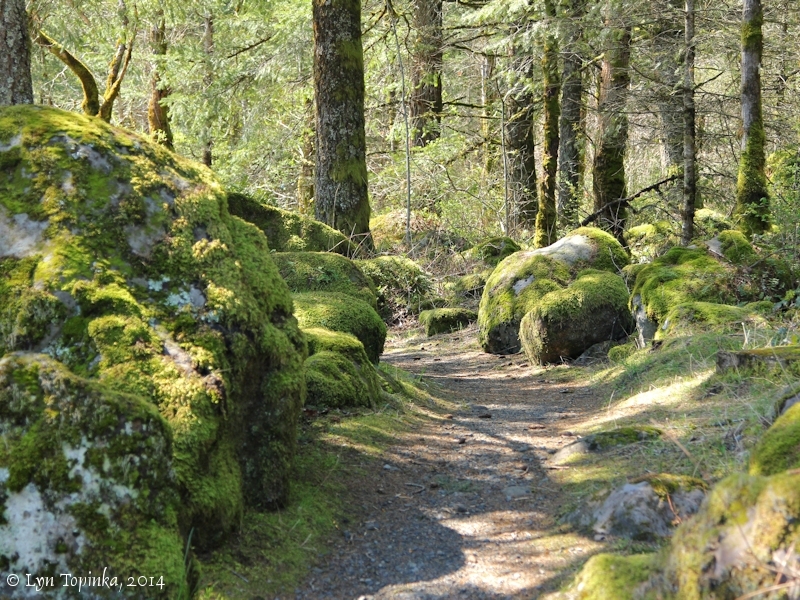 The trail through the Fort Cascades Historic Site goes through these exposed boulders. Click image to enlarge Boulders uncovered during the flood of 1894, Cascades Townsite, Hamilton Island, Washington. Image taken April 2, 2005. 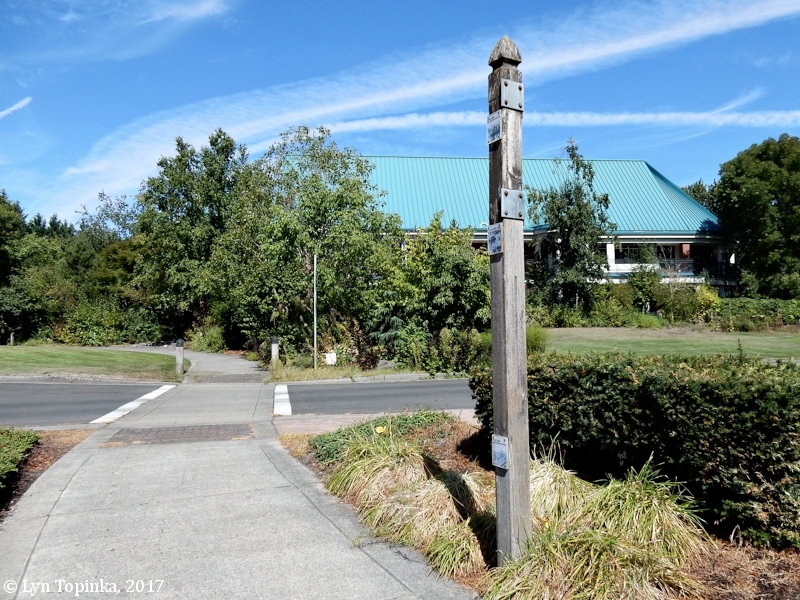 Vancouver, Washington's Water Resources Education Center, located upstream of Ryan Point and downstream of Winter Park, has a staff gage on its property showing the high water marks of the 1894 "Great Flood", the 1948 "Vanport Flood", and the 1996 Columbia River flood. Click image to enlarge Staff Gage, Water Resources Education Center, Vancouver, Washington. Staff gage shows height of 1894 (top, left side of gage), 1948, and 1996 (bottom) Columbia River floods. Image taken January 1, 2006. 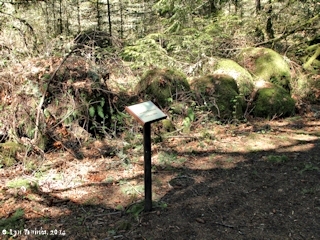 Click image to enlarge 1894, 1948, and 1996 high water marks, Water Resources Education Center, Vancouver, Washington. Image taken August 30, 2017. 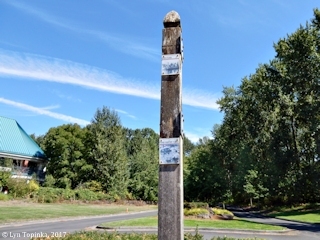 Click image to enlarge 1894 high water mark, Water Resources Education Center, Vancouver, Washington. Image taken August 30, 2017. 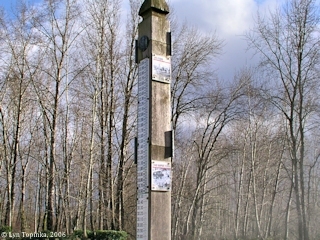 Click image to enlarge Staff Gage, with 1894 high water and 1948 high water, Water Resources Education Center, Vancouver, Washington. Image taken January 1, 2006. 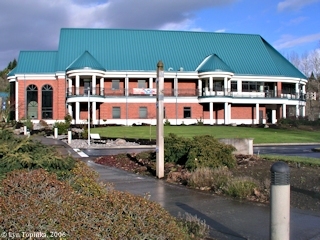 Click image to enlarge Staff Gage showing 1894 high water, Water Resources Education Center, Vancouver, Washington. Image taken January 1, 2006. At Vancouver, where the river level was monitored but not the flow velocity, the Columbia reached its all-time record high on June 7, 1894, 34.4 feet above sea level. The normal river level at the Vancouver gauge, which is located at river mile 106.5, five miles upstream from the confluence of the Columbia and Willamette, is 1.2 feet above sea level. [Source: NWCouncil.org website, 2018]. Flood stage: -- 16 ft. 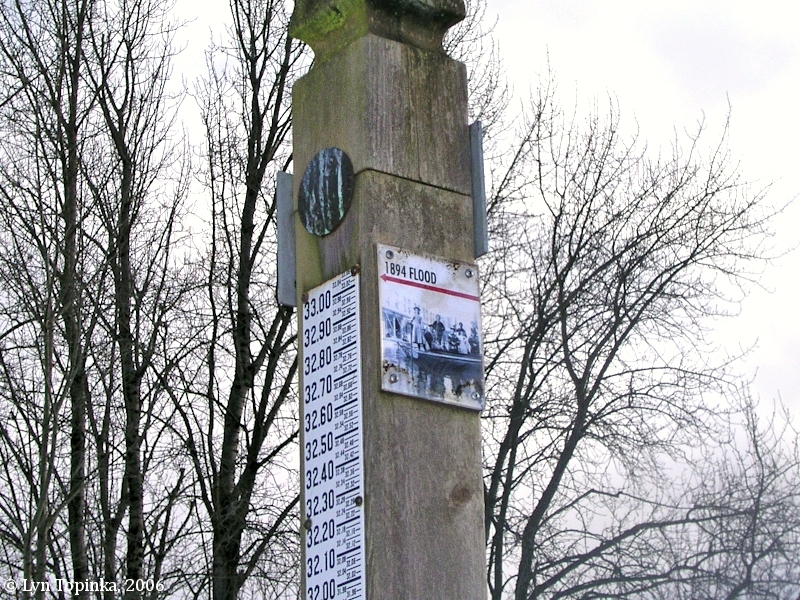 Historical data: -- Maximum stage known, 33.6 ft June 7, 1894, from floodmarks. Peak stages and discharges: June 7, 1894, Gage height was 33.6 feet. During the late 1900s, with only a railroad bridge crossing the Columbia River, ferry service was the method to get from Vancouver to Hayden Island and then on into Portland. The "Great Flood of 1894" destoryed that early bridge and disrupted ferry service. "At Portland, the river reached a high-water mark of 33.5 feet, the worst flood ever recorded in the city. Surging high water covered 250 square blocks and knocked out public utilities, warehouses, and docks. Two drawbridges were stuck open, limiting travel between the east and west sections of the city. Businesses sold merchandise from their second-floor windows or operated from boats floating on city streets." [Source: William F. Willingham, "Oregon Encyclopedia", 2018]. "Although the congestion caused by 1500 barges, rafts and rowboats in the "canals" of Portland presented a difficult problem for traffic officers, many local citizens enjoyed the novelty of fishing from windows during the flood of June, 1894, according to newspaper accounts of the flood discovered by a research worker for the WPT writers' project. On May 27 the Willamette covered Front street, and rose nearly a foot a day for several days. The next day merchants began moving good as warehouses were under water. June 2, 3, and 4 the streets were full of boats, batteaux, barges, and rafts moving goods to places of safety. The water at the time was five feet deep on Front. By June 7, the water reached Broadway and Oak. On Ash street a depth of more than seven feet was reported, and "heavily loaded barges are towed down the street with ease. One was towed up Davis street as far as Sixth, to unload." Third street, the main thoroughfare at that time, was known as the Grand Canal. Street cars were motionless, except on Washington and Second streets. Business was suspended. The gas supply failed, and coal oil lapmps had to be brought down from the attic in many homes. At the railroad yards engines were submerged. Fires were fought with fire apparatus on barges. Scaffold sidewalks and bridges across streets were built. Thousands of feet of sidewalk floated. The flooded area extended from Front and Main streets, south, along the river to N.W. 21st and Reed. The maximum width from the river was 12 blocks on Flanders street, and 11 blocks on Everett, according to a map which accompanied the news account. The flood lasted 24 days. An estimate of the damage was placed at $2,000,000, but was generally considered far too low, one man estimating his own loss at $300,000. Docks and warehouses suffered greatest losses. ..."
Source: "Bonneville Dam Chronicle", June 24, 1938, courtesy Historic Oregon Newspapers Archives, University of Oregon Libraries, 2018. "For miles on both sides of the river houses, barns and fences have been swept away, and the losses sustained by farmers and others cannot now be estimated. Columbia City is pretty well under water, and a great deal of damage has been done at St. Helen's. The wharf of Muckle Bros. has been raised from the under piling, but what the damage will be no one could tell." Bankfull stage. -- 23 ft. Historical data. -- Maximum stage known, 24.7 ft June 7, 1894. Peak stages and discharges: June 7, 1894, Gage height was 24.7 feet (backwater from Columbia River).